This Victorian weatherboard house puts you in easy reach of the city and Salamanca Place, a fully self-contained property you will find everything you need for a comfortable stay - kitchen, laundry, living room with wood heater, dining room. Enjoy the beautiful garden from the deck, pick your own greens and herbs or catch a view of the mountain from the front verandah in the late day sun. There is also an attic retreat for reading or relaxing, which offers a great view of the harbour. A telephone for local calls is provided. "We all enjoyed staying at Top House over the recent long weekend. As we had visitors from the UK, I was after a place that gave an idea of the architecture of an era. The house was very comfortable and had all that we needed. Very nice touch of having the bottle of wine, which was thoroughly enjoyed. House has a lovely aspect and great views and its close enough to down town to walk down and catch a bus back up. I'd recommend the place warmly." 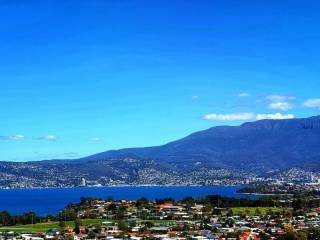 West Hobart is on old, established suburb of Hobart with beautiful heritage houses and lovely gardens. 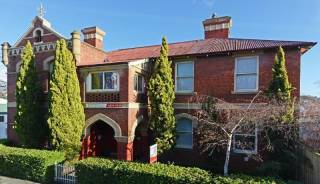 Centrally located, it is a few minutes drive from restaurants in North Hobart, Salamanca Place or Sandy Bay. 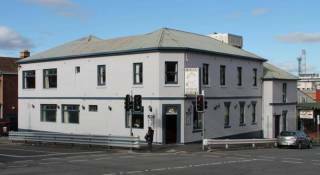 There is also a fabulous neighbourhood restaurant, Paesano Pizza and Pasta, for Italian food and Landsdowne Cafe a little further around the Crescent for breakfast or lunch. A corner shop/postoffice provides all your daily needs and there is a bus stop right outside their door with frequent service. A gourmet grocer, butcher and chemist is just 2 blocks away and a secure children's playground is just a block away. “Property” means Top House self-contained accommodation and all its fixtures, fittings and equipment. • Check-in time is not before 2 pm on the arrival date and check out time is not later than 10 am on departure date. • You must notify Management of expected arrival time and a mobile contact number at least 5 days before arrival. • Check-in/check-out and key collection/return procedure will be as follows: An access code will be provided to you 7 days before your arrival and on payment of the balance in full unless special arrangements have been made prior to arrival. All keys must be returned to the locked box on the verandah on departure. • If you wish to vary or cancel the Booking, please contact us immediately. • If you cancel the booking within 3 days of arrival and the full amount has been paid there is no refund. • Should you be eligible for a refund it will be made through your chosen payment method. • If Management is able to relet the Property for the period cancelled a further refund may be made less administration charges, commissions and expenses. • We supply linen, pillows, blankets and towels which must be left where supplied in the bedrooms or bathroom on departure. Further linen may be hired through Management. Beach towels are not included. • Cleaning and linen change usually occurs weekly or more often upon request and at additional cost. • Teach your children that fire is a tool for adults to use, not a toy. • Don't let your children use fire - helping with lighting the wood heater encourages children to think that they can control fire. • Teach your children facts about fire safety and the consequences of fire. • Supervise your children at all times around fire. Don’t allow children access to matches. Remove the temptation, keep matches and lighters out of sight and reach - just like you lock away medicines and other dangerous household substances. • Don't place clothing too close to the wood heater - it should be at least two metres (six feet) from any source of heat. • Never leave clothes near the wood heater if leaving the house or going to bed. • Check clothing regularly if drying near a heater. • Use the fire screen at all times with the wood heater. • Don't sit too close to the wood heater. • Don't leave the wood heater door open or remove the screen. • Be careful with the disposal of ashes from the hearth or wood heater. Ashes can take up to five days to cool. Always place ashes in a metal container. Dispose of ashes well clear of your home and pour water over them. • You must comply with all House Rules and all instructions from Management and the caretakers of the Property concerning occupancy, property, health, safety and quiet enjoyment of the Property and our neighbours. • A refundable damage deposit of $300 is due 7 days before arrival and is refunded within 7 days of departure after inspection of the property. • Only the guests nominated and agreed in the Booking may stay in the Property overnight. If any other guests stay extra charges of $30 per person will apply or the agreement may be terminated without refund. • Before departure, all rubbish is to be put in the appropriate council rubbish bins provided, and crockery and cutlery washed and packed away. The Property must be left in a clean and tidy condition. All keys must be returned to the locked box on the verandah. • You are responsible for the safekeeping and replacement of accommodation keys. Duplicate keys will be provided at an additional charge of $20.